Over 40 million Americans already have porous, brittle bones – or are at a high risk due to low bone mass. Bone density diminishes with age – and increases your risk of fractures, hip replacements and even premature death caused by the trauma of a broken hip. Now is the time to take action to support the health and function of your bones. The sad truth is that breaking a hip, arm or wrist is usually the first clue that your bones are fragile. And with weak, porous bones – even a sneeze or a wrong step – can land you in a hospital or a nursing home later in life. In fact, did you know that getting "shorter" as you get older, feeling frail and that noticeable "hump" are NOT a normal part of aging – they’re simply signs of bone density loss. However, just the same as you can strengthen and support your heart, brain and muscles – you can do the same for your bones. Don't be fooled with the big "Calcium Hoax"
It's true that calcium is important for bone health. That's why it's vital to include calcium-rich foods like spinach, almonds, yogurt and cheese in your diet. But if you’re taking ordinary calcium supplements – you may be taking the wrong kind of calcium – if so, the result will be that you get little (or no) bone health support. Most calcium-based products use synthetic or inorganic forms of calcium found in limestone, oyster shells or groundwater. Your body simply can’t process those types of calcium effectively – and you get very little (if any) benefit for your bones. You need calcium which comes from natural, organic food sources that can be assimilated by your body and stored properly in your bones. Our Bone-Support formula contains high-quality marine calcium in the form of Aquamin® TG. Why do we go to such great measures? Because you deserve the best quality calcium! It is important to know that this calcium is sustainably sourced. This also means that there is no environmental impact during harvesting. Xtend-Life is committed to the protection of the marine environment. “Throwing calcium into a body that has low bone density and expecting it to strengthen bones is like putting flour into a bowl, sticking it in the oven and expecting it to come out as bread.” – Doug DiPasquale, Holistic Nutritionist. That’s why it is important to supplement with a comprehensive bone formula that contains quality calcium – and much more! The bio-active nutrients found in Bone-Support help support and strengthen your skeletal system. These nutrients include vitamin K2, strontium, Mangosteen extract, Vitamin D3 as well as 7 other bone-nourishing nutrients. Plus: These bio-active ingredients ensure that the body manages healthy calcium absorption directly benefiting the bones. These ingredients have been combined in a synergistic way. In other words – they are designed to all work together to deliver optimal bone health support. Together with a good diet and moderate weight-bearing exercise – Bone-Support is the supplement you need to maintain healthy bones and a well-functioning skeletal system. Bone-Support may be taken independently. However, for the best possible results – combine Bone-Support with the Core Wellness Activators! To learn more about Core Wellness Activators. Protect yourself against osteoporosis and bone density loss with Bone-Support. The ingredients used in Bone-Support include all the essential nutritional elements needed to help build and sustain strong bones. For best long term benefits, combine with Total Balance. Other Ingredients: Maltodextrin, Capsule (Hydroxypropylmethyl Cellulose, Water). Does not contain soy, dairy, gluten, shellfish, peanut. Daily serving: Men or women - 3 capsules. Take first thing in the morning or split into 2 doses in the morning and later in the day. 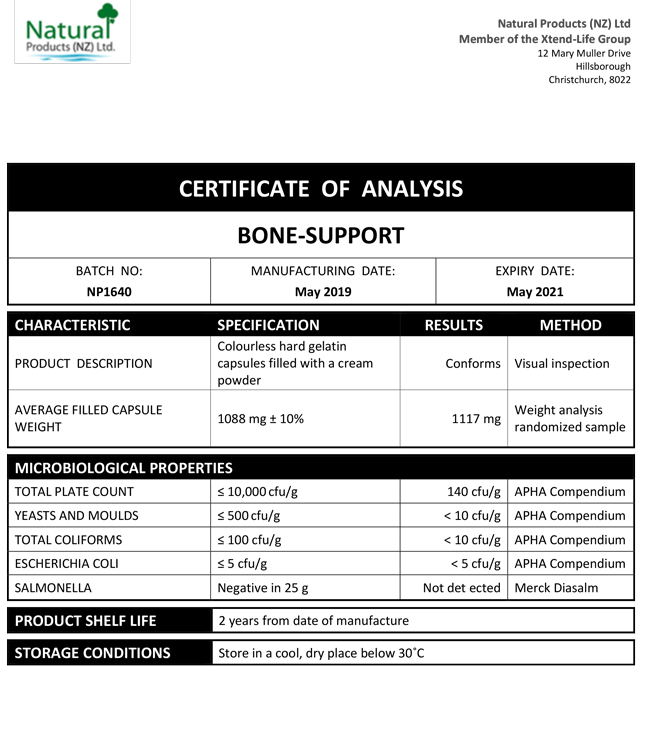 We have included below a copy of a typical Certificate of Analysis (CoA) for our Bone-Support product. You will note that there are two columns which are headed 'Specification' and 'Results' respectively. The specifications are simply our minimum standard to which each batch of Xtend-Life Bone-Support has to conform, otherwise we would not release it. The results are the actual results from the independent laboratory that did the testing. What are the main benefits of Bone-Support? Bone-Support is specially formulated to support and maintain healthy bones and a well-functioning skeletal system. Supporting a stronger skeleton with a high quality, bio available product such as Bone-Support may contribute to better posture and improved mobility. Damage to cartilage that may become more common with aging is supported, as is a healthy blood calcium level which is crucial to various bodily processes. What is the recommended dosage for Bone-Support? What age is Bone-Support recommended for? Bone-Support may be taken by adults of any age, but it is generally not recommended for children and should not usually be needed. If you are concerned your child may be lacking in calcium we advise seeking the opinion of your doctor and of course aiming to add as many calcium rich foods to their diet as possible. Due to the drop in estrogen, which holds calcium in the bones, post-menopausal women often benefit from including a greater amount of calcium-rich foods in the diet, as well as supporting this with a quality supplement such as Bone-Support. Please speak with your doctor for advice regarding the amount of calcium that you may need each day. How can I be sure that my body will be able to absorb the calcium in Bone-Support? Calcium is a vitally important mineral for the body. However due to many factors, the manner in which it is utilized or absorbed varies greatly from person to person. Calcium is carried through the bloodstream in two distinct forms: about half is in a usable ionized form, and the other half is attached to protein and is unavailable as a nutrient. However, if the pH (the acid/alkaline balance) is too alkaline, even the usable calcium may not be able to be utilized. The Aquamin TG Calcium used in Bone-Support is particularly excellent to ensure adequate absorption, as it also has a natural ability to balance the pH of the body. We understand the importance of using a form of calcium which comes from natural, organic food sources that can be assimilated by your body and stored properly in your bones. Alongside this calcium are a range of other highly beneficial, complementary nutrients that help enhance absorption, some of the key ingredients involved in this are Vitamin K2, Strontium, Mangosteen extract, and Vitamin D3. Is Bone-Support a good product to use for supporting osteoporosis? Bone-Support is a very useful product to provide support in the case of Osteoporosis. It may be used to complement a healthy diet that contains an array of calcium-rich foods, along with gentle weight-bearing exercise, which helps to prevent further bone loss. Of course, it is important to visit your doctor regularly in order to monitor the health of your bones and obtain expert medical advice. Your doctor may recommend regular bone density scans, as well as pharmaceutical supplementation if necessary. As with all of our products we recommend checking with your doctor before beginning Bone-Support. Why does Bone-Support only have 53% of the recommended daily intake (RDI) of calcium? Bone-Support contains 53% of the RDI of calcium, which may seem low in comparison to other products that may include 200% of the RDI. However, there is a very good reason for this; research has shown that the body is not able to absorb large amounts of calcium when taken in one dose, especially if it is in a poor quality form. The body will protect itself from obtaining too much calcium by absorbing less, if a high level is consumed. Therefore, even though a higher RDI may appear beneficial, it may in fact result in a lower absorption rate. Likewise, taking a lower dose of a high quality calcium, such as Bone-Support, may result in an enhanced absorption. We have chosen to use a naturally sourced, bio-available calcium sourced from mineral-rich red algae in Bone-Support, which is named Aquamin TG. This is easily recognised and absorbed, thus achieving more positive results than a higher amount of a poor quality calcium. Importantly, it also has an alkalising effect in the body which is crucial to support an optimal pH balance to enable the efficient absorption of calcium. We also believe that the majority of people should be able, or at least aim, to get as much calcium from dietary sources as possible. In conjunction with a generally healthy lifestyle and regular weight bearing exercise to help support bone health, especially with aging. Are there any side effects associated with taking Bone-Support? Our Bone-Support formula is a completely natural product so the potential for negative side effects is greatly reduced. However, this is not to say that reactions will never occur, as some people may be sensitive to particular ingredients. Any side effects experienced should be mild and last only for a few days. To gain the best results from this product it should be taken two to three hours away from other supplements and prescription medication, this helps to support the best absorption and minimizes interactions between ingredients. Can I take Bone-Support if I use prescription medications? Many chemical and synthetic drugs will interfere with natural ingredients and vice versa. It is always recommended to consult with your physician prior to adding any supplement to your regime. It is important to be aware that Bone-Support contains Vitamin K2, so if you are on blood thinning medication you should discuss the use of Bone-Support with your physician. Yes, there is certainly no reason why children could not take Bone-Support, but it should not generally be needed provided a healthy diet is consumed, in conjunction with regular physical activity. A great source of calcium for children is full-fat dairy products such as yogurt, milk and small amounts of cheese, plus leafy greens. Also, avoid sodas as these can impact upon the absorption of calcium which is crucial as the skeleton is developing. Does this product strengthen teeth? Bone-Support may well help given that the teeth have a similar composition to bones. It may help to strengthen the teeth from the inside out, helping to prevent future decay. However, please bear in mind that once damage to the tooth enamel or decay has occurred, it is very difficult to reverse with a supplement alone. Poor condition of the teeth due to unfavorable dietary choices is best addressed by your dental professional.